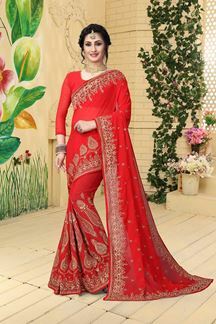 Stun the crowd as you don this tempting red designer saree all over decorated with zari motifs while the bottom part of the pallu is done up in heavy zari accentuation in a breathtaking glow! This saree comes with matching fabric unstitched blouse. The blouse in this picture is for photo purpose only. Note: Color may slightly vary due to digital photography.